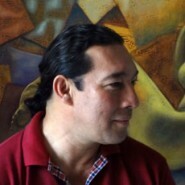 Manuel is from Oaxaca, Mexico and has been painting since a child. He also sculpts in wood and stone. While his work exhibits a high regard for his indigenous Mexican roots, his travels in Central America and Europe have contributed much to his approach to art. His first solo exhibition was held in Strasbourg.